great yoga classes in Bellmore located on Long Island's Nassau County; best yoga teachers; Kundalini yoga, restorative yoga, chair yoga, beginner yoga, meditation, Long Island, New York. Fascinating workshops in Bellmore, Nassau County, Long Island. | Moonflower Yoga Inc. Looking for a great yoga studio in which to practice yoga, meditation or learn something new in a workshop or event in the Bellmore-Wantagh-Merrick-Seaford-East Meadow-Levittown area of Nassau County, Long Island? Check out the fabulous array of yoga classes, workshops and events that are offered at Moonflower Yoga with great yoga teachers! Our small class setting and friendly, homey yoga studio is a wonderful place where you can release stress, become more flexible and stronger, make new acquaintances and learn something new. In the descriptions below, you will find additional info on our current classes, workshops and events. You can reserve your spot in any of these available classes, workshops, or events from the “Schedule” tab above – just click on the date for the activity you wish to attend and then follow the simple registration and payment steps. Looking to get in shape? We have a fabulous STRETCH INTENSE AND RESTORE yoga class with Danielle Meill offered on alternate Mondays at 7:30 PM. This great class is for intermediate-level students with some yoga experience who would like to stretch and move a bit more deeply in their practice. Come give it a try! Looking for a great way to de-stress and end your day? Try TUESDAY STRETCH AND RELAX with Melinda on Tuesday at 615 PM, YIN YANG YOGA with Dona Dovie on Wednesday nights at 7:45 PM, or EVENING STRETCH AND RELAXING RESTORATIVE YOGA with Melinda on Thursday nights at 7:45 PM. Both of these great yoga classes are for all fitness levels and will enable you to stretch and relax from your day. Do you have mobility issues but would still like to practice yoga? CHAIR YOGA is the answer for you! Moonflower Yoga offers 3 morning Chair Yoga classes each week: Tuesday at 11 AM, Thursday at 11:30 AM, and Friday at 11:15 AM. We also have a WALL AND CHAIR YOGA: A SUPPORTED SEQUENCE class with Lynn on Wednesdays at 4:45 PM for those who have difficulty coming up/down from the floor but would like a great class to improve strength, flexibility and balance or try the CHAIR BODY STRETCH AND MEDITATION with Lynn on Wednesdays at 6 PM which combines seated chair poses to gain better strength and flexibility from a chair, followed by a relaxing meditation to reduce stress. Also great for beginners is the BEGINNER YOGA FUNDAMENTALS class on Mondays at 430 PM, perfect for beginners or those looking for a gentler yoga practice, as well as the BEGINNER STRETCH class on Mondays at 6 PM. You could also join Moonflower Yoga owner, Nancy Weshkoff, for a BEGINNER YOGA class on Saturdays at 8:30 AM or Sundays at 9:45 AM. Looking for a unique, beginner-level class with an opportunity to discover meditation? Try STRETCH AND MEDITATE 101 on Thursdays at 4:30 PM with Lynn Carapella, a great way to help you relax and explore a meditation practice. Meditation is recommended by doctors as a wonderful stress-reducing tool. Are you new to yoga? 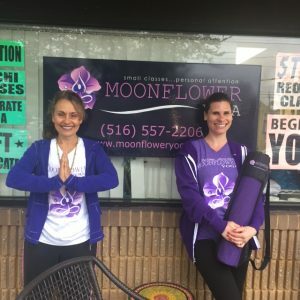 Click on the “FAQ” tab above on the far right side, and you’ll see a complete list of the great BEGINNER YOGA classes that you can try at Moonflower Yoga. We have yoga classes on the schedule each day of the week which would be suitable for beginners. You can also look for the “(B)” symbol next to the class title on the Schedule tab to see if it the class you have selected is suitable for a beginner. Are you looking for an INTERMEDIATE-LEVEL yoga class? Moonflower Yoga offers these too! Look for the “(I)” symbol next to the class title on the Schedule tab. Scroll down to the Class Descriptions section below for further info on all of our great yoga classes. Life has many challenges that create stress. Stress is harmful and leads to conditions such as heart disease, high blood pressure, and more. 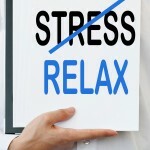 Reducing your stress can lower your disease risk. This series of classes on Tuesday nights are designed to help you reduce your stress and feel better. You’ll love this great variety of interesting and calming classes! Relax with Reiki with Nancy (April 23rd): Enjoy a great, de-stressing class with Moonflower Yoga owner and Reiki Master Teacher Nancy! This lovely class will give you an opportunity to enjoy the calming and relaxing effects of Reiki. You will be seated in a chair for the class which begins with a guided meditation. From there, you will enjoy relaxing Reiki treatments. Essential oils will be diffused with soft music to help you unwind. Come give this de-stressing class a try! Kundalini meditation & gong relaxation with Cathi (April 30th): Release the stress of your day through pranayama (breathing techniques), meditation and an extended gong bath. The immediate effects of Kundalini technique will allow you to relax and let go, while gong therapy restores the body and mind to a state of peace. Candlelight Restorative class with Nancy (May 7th): Feeling stressed? Melt away your stress in this lovely, very relaxing Candlelight Restorative class which is done while resting on the floor. You will spend several minutes gently stretching and unwinding in each restorative posture with the help of props such as bolsters, blankets, and pillows. The class will be lit by candlelight with soft music in the background. Essential oils are diffused to help you further relax. Nancy, who is a Reiki Master Teacher, also provides a brief, optional Reiki treatment while you are reclining for those who choose to have a Reiki treatment. You will leave feeling refreshed and renewed! Less Stress meditation with Cathi (May 14th): In this fabulous session, try a “Less Stress” Meditation with Cathi! Enjoy tranquility of body and mind through guided meditation and Reiki healing. Meditation helps you to connect to the present moment while the flow of Reiki energy encourages relaxation and well-being. All are welcome to attend this lovely class. Candlelight Restorative class with Nancy (May 21st): Feeling stressed? Melt away your stress in this lovely, very relaxing Candlelight Restorative class which is done while resting on the floor. You will spend several minutes gently stretching and unwinding in each restorative posture with the help of props such as bolsters, blankets, and pillows. The class will be lit by candlelight with soft music in the background. Essential oils are diffused to help you further relax. Nancy, who is a Reiki Master Teacher, also provides a brief, optional Reiki treatment while you are reclining for those who choose to have a Reiki treatment. You will leave feeling refreshed and renewed! Kundalini meditation & gong relaxation with Cathi (May 28th): Release the stress of your day through pranayama (breathing techniques), meditation and an extended gong bath. The immediate effects of Kundalini technique will allow you to relax and let go, while gong therapy restores the body and mind to a state of peace. Here is the snapshot summary of the upcoming Moonflower Yoga workshops and events and you’ll find the fuller description listed further down, as well as on the Workshop or Events tabs. This is a great opportunity to learn something new, have fun, and make new friends! You can register for any of these amazing workshops or events from the Schedule tab above and following the simple registration steps. Register early – these sell out quickly! Reiki Level One training: Saturday, April 27th, 1:15 PM – 5:45 PM – Was sold out – one spot just opened up – book now or try June 2nd: Come learn the basics of Reiki and receive a Reiki Level One certification. You will learn the history of Reiki and how to do a Reiki treatment on yourself as well as others. You will discover the relaxing qualities of Reiki and be supplied with an informative book to continue your Reiki experience after you complete this Level One certification. This Reiki Level One training will be taught by Reiki Master Teacher and Moonflower Yoga owner, Nancy Weshkoff. 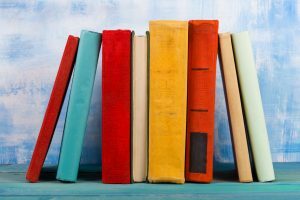 Moonflower Yoga Book Club: Sunday, April 28th, 4:30 PM – 6 PM: Take a journey with a great book while having fun and making new friends! For our next meeting we will be discussing “Behind Closed Doors”. All are welcome to read this book and join us. Click on the “Clubs” tab above for more info on the books. 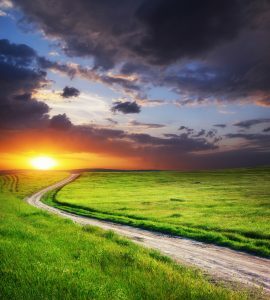 A Gathering for Self-Realization and Meditation with Chandresh: Friday, May 3rd, 630 PM-8 PM: Do you struggle with finding the purpose of your life? Do relationships and career stress you out? Have you been looking for spiritual guidance to live your highest self? If you answered “yes” to any of the above, then this wonderful workshop with 7th generation spiritual teacher and best-selling author Chandresh Bhardwaj is for you! Click on the “Workshop” tab for additional info. Book early as Chandresh’s previous workshops at Moonflower Yoga all sold out. 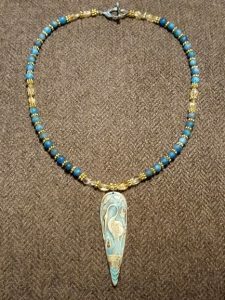 Make a Beautiful Mother’s Day Gemstone Necklace workshop with Carol Procopio: Saturday, May 4th, 1:30 PM – 3:30 PM – filling up quickly – book now! : Create a beautiful necklace for yourself or for someone special in your life from gemstones including meditative blue apatite and prosperity-fostering citrine with a blue patina brass focal piece depicting an elegant great heron, a symbol of peacefulness, self-awareness and confidence. All materials included in the price. Reiki Healing Circle (Nancy): Friday, May 10th, 6:30 PM – 8:15 PM: Start the year in a relaxing way with a wonderful Reiki Healing Circle! Each person has an opportunity to receive a lovely Reiki treatment. There will also be guided meditation before the Reiki treatment. Moonflower Yoga Mah Jongg Club: Sunday, May 5th, 2 PM – 3:30 PM: Come join us for this fun club! Newcomers, as well as experienced players willing to work with newcomers, are welcome. Click on the “Clubs” tab for additional info. Reiki Level Two training: Sunday, May 19th, 1:15 PM – 5:45 PM – SOLD OUT – wait list available or try June 29th: Further explore Reiki in this Reiki Level Two training, open to anyone who successfully completed Reiki Level One. Learn the first 3 symbols of Reiki including the distance symbol to send healing energy to someone who is not in the same room as you. This training session will be done by Nancy Weshkoff, Owner of Moonflower Yoga and Reiki Master Teacher. Moonflower Yoga Mah Jongg Club: Saturday, June 8th, 2 PM – 3:30 PM: Come join us for this fun club! Newcomers, as well as experienced players willing to work with newcomers, are welcome. Click on the “Clubs” tab for additional info. 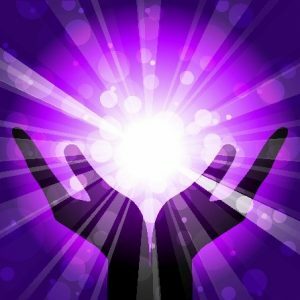 Reiki Level One training: Sunday, June 2nd, 1:30 PM – 6 PM – book early – previous sessions sold out: Come learn the basics of Reiki and receive a Reiki Level One certification. You will learn the history of Reiki and how to do a Reiki treatment on yourself as well as others. You will discover the relaxing qualities of Reiki and be supplied with an informative book to continue your Reiki experience after you complete this Level One certification. This Reiki Level One training will be taught by Reiki Master Teacher and Moonflower Yoga owner, Nancy Weshkoff. Reiki Level Two training: Sunday, June 9th, 1:15 PM – 5:45 PM – SOLD OUT – try June 29th: Further explore Reiki in this Reiki Level Two training, open to anyone who successfully completed Reiki Level One. Learn the first 3 symbols of Reiki including the distance symbol to send healing energy to someone who is not in the same room as you. This training session will be done by Nancy Weshkoff, Owner of Moonflower Yoga and Reiki Master Teacher. Moonflower Yoga Needle Arts Group: New date TBA shortly! : Come join our fun group and learn how to do basic crocheting and knitting! 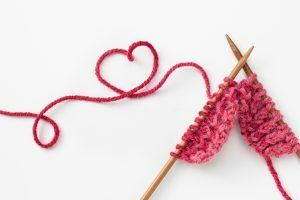 Newcomers, as well as people experienced in knitting and crocheting, are welcome. Discover the meditative quality of needle arts! Reiki Level Three Master Practitioner training: Saturday, June 22nd, 1:15 PM – 5:45 PM – book early as our previous sessions sold out! In this training session, you will become a Reiki Master Practitioner! The training is open to anyone who successfully completed Levels One and Two. Learn the final 3 symbols of Reiki and receive 4 additional attunements. Reiki Level Two training: Saturday, June 29th, 1:15 PM – 5:45 PM – book early as this sells out quickly: Further explore Reiki in this Reiki Level Two training, open to anyone who successfully completed Reiki Level One. Learn the first 3 symbols of Reiki including the distance symbol to send healing energy to someone who is not in the same room as you. This training session will be done by Nancy Weshkoff, Owner of Moonflower Yoga and Reiki Master Teacher. STAY TUNED! We are planning more great workshops and events for the coming months! STRESS-BUSTER SERIES (various) (B): Check out this wonderful variety of classes designed to help you feel better through relaxation. Each week there will be a different one-hour session. Scroll to the top of this screen for further information. 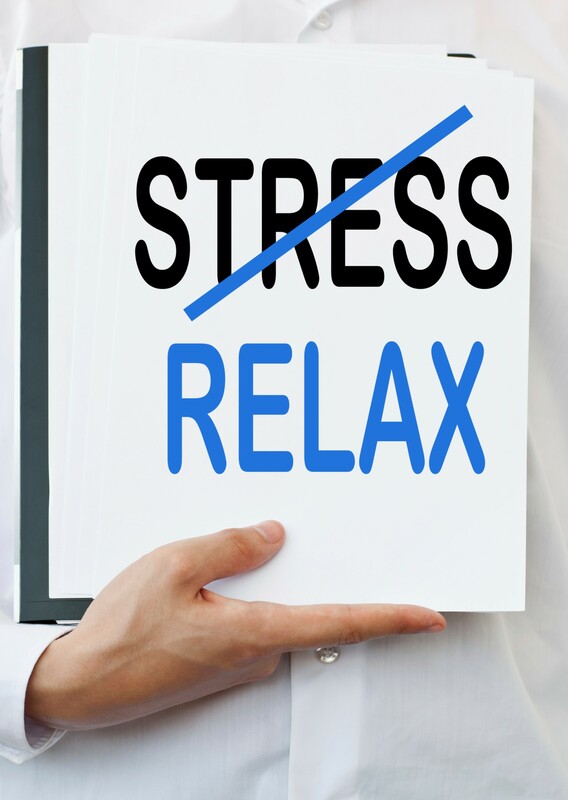 Choose from a de-stressing Kundalini meditation & gong bath (April 30th and May 28th) with Cathi, or an extra night of Candlelight Restorative with Nancy ( May 7th, May 21st)), or a lovely seated Relax with Reiki with Nancy (April 23rd), or a Less Stress meditation with Cathi (May 14th). CHAIR YOGA STRETCH (B) (Rose) (NEW! ): If you have difficulty coming up/down from the floor in a regular yoga class, come give this great chair yoga class a try! This is a gentle, beginner-level yoga class where fundamental yoga poses will be done seated in a chair or with the support of a chair for those who can stand while holding a chair. Rose, who is also a yin yoga teacher, will emphasize poses for stretching your muscles. The class will also encompass poses for flexibility and strength building. For those who can stand, there will also be balance poses using a chair for support if needed. In all the poses, you will learn how to link your breath to movement. Rose will teach you some simple pranayama breathing techniques to help you relax. The class will end with several minutes of quiet solitude seated on your chair. This is a wonderful class to help you get stronger and more flexible in a gentle way while also giving you an opportunity to de-stress and relax. Please join Rose for this fabulous class! (Fridays at 11:15 AM starting in April). See also the Chair Yoga classes on Tuesday at 11 AM, Thursday at 11:30 AM, and Wednesday at 445 PM and 6 PM. YIN YANG YOGA (B) (Dona Dovie) (NEW! ): Yin Yang yoga blends two styles of yoga in one class, bringing together the benefits of both moving yang poses and passive yin stretches. The class begins with a yang emphasis of building energy with simplicity and ease of movement in basic beginner-level hatha yoga poses. In the yin portion of class, the focus switches to stillness and long-held postures on the ground promoting flexibility and deep release to the body’s fascia muscle. The class ends with a traditional Shavasana (closing resting pose). As the whole body rests, enjoy feelings of relaxation that arise as you slow down and move from noise to silence, allowing the mind and nervous system to calm and reset. Combining both Yin and Yang elements in one class provides a healthy and balanced practice for mind, body and heart. Come give this great class a try! (Wednesday nights at 7:45 PM). FRIDAY STRETCH (B) (Rose) : Looking for a great, late morning, beginner yoga class on Fridays? Come try Friday Stretch – perfect for all fitness levels. In this class, taught in a yin yoga style, you will do stretching postures on the ground with the assistance of props such as bolsters, blankets, pillows, and blocks to allow you to deeply relax into the posture. This will help you increase your flexibility and strength. It is also a wonderful way to release stress from the week and get you ready for a fabulous weekend! (Friday mornings at 10 AM). CHAIR BODY STRETCH AND MEDITATION (Lynn) (B): Have difficulty reaching the floor? Feeling stressed? Muscle tension? Need to improve your strength? If the answer to these questions is “yes”, then this fantastic evening class is for you! This class will be done while comfortably seated in a chair. You will stretch your muscles, build strength, and improve flexibility through the wonderful practice of yoga. Props are available to support you. After releasing muscle tension through stretching and implementing pranayama breathing techniques, there will be opportunities to engage in mindfulness meditation, as well as experiencing guided meditation in a variety of areas. Doctors agree meditation is a great tool for stress reduction. You will end the class with several minutes of quiet relaxation and meditation in soft candlelight. Lynn will offer Chair Reiki to those who would like to receive it. All levels, including beginners, are welcome (Wednesdays at 6 PM). YOGA BASICS (B) (Danielle): Join us for a great class, designed to provide you with a deeper understanding about the basics of yoga! Yoga is a moving meditation that focuses on linking the movements of the body with the breath. This class will focus on some key poses that stretch and strengthen various parts of the body while creating a feeling on peace and calm. Whether you are a beginner or a seasoned practitioner, this class will allow you to take your practice to the next level! (Tuesdays at 5 PM). 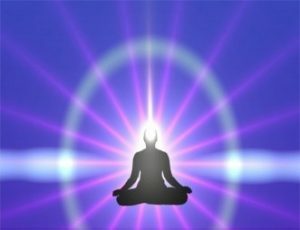 KUNDALINI (B) (Lori/Cathi): Kundalini Yoga is known for its ability to promote health, creativity & spiritual awareness, and combines physical exercise, breathing techniques, mantra (chanting) & meditation. Catering to both beginners and advanced students, Kundalini yoga strives to offer a space wherein students feel accepted & safe to embrace the greatest mission of our time…moving from the head to the heart. (Sunday at 11:15 AM with Lori; plus a 6:15 PM class on Thursdays with Cathi. Also try Kundalini yoga & gong bath with Cathi on a monthly basis as part of our Stress Buster series. Lori also offers a harp/gong meditation workshop every other month on a Friday night (check the Workshop tab for the next date). SATURDAY FLOW (I) (Nancy): Begin your Saturday with this fun, energetic and CALORIE-BURNING Vinyasa Flow class. After a gentle warm, you will be guided through Vinyasa flow poses which will build strength, flexibility, and balance. Work off your tension from the week and have a great start to your weekend! Some previous Vinyasa flow experience is recommended. The class ends with a relaxing restorative pose. You’ll feel amazing. (Saturdays at 10 AM). BEGINNER YOGA FUNDAMENTALS (B) (Rose) : Are you new to yoga? Are you looking for a gentle yoga practice? Come explore this wonderful class with Rose Edelman! This beginner-level class is for those students who would like a slower-paced, gentle yoga class while working on poses to improve your flexibility, strength, and balance. Props are used to support you as you learn basic postures. Rose will also teach you how to link your breath to movement which will help you with your practice. The class will end with several minutes of quiet relaxation reclining on the ground to reduce your stress. Come give this fabulous class a try! (Mondays, 430 PM). CHAIR YOGA (B): Thursday mornings at 11:30 AM with Lynn, plus Tuesday mornings at 11 AM with Nancy, plus the 3 chair classes listed at the end of this description – If you have difficulty moving in a regular yoga class, or if you are an office worker looking to learn some yoga poses to do while seated at your desk to relieve muscle tension and stress, then give this gentle, beginner-level chair yoga class a try! The class will consist of fundamental yoga poses done seated in a chair or with the support of a chair for those who can stand while holding a chair. You will learn poses to help with flexibility, stretching & strength building. For those who can stand, there will be balance poses using a chair for support. In all the poses, you will be guided to link your breath to movement. The class will end with quiet relaxation seated on your chair followed by a brief meditation. (Tuesdays at 11 AM; Thursdays at 11:30 AM). NOTE: See also the “Wall and Chair Yoga: A Supported Sequence” class on Wednesdays at 445 PM, the Chair Body Stretch and Meditation class on Wednesdays at 6 PM, and the Chair Yoga Stretch class with Rose on Fridays at 11:15 AM). CANDLELIGHT RESTORATIVE (B) (Nancy): Recharge your batteries in this lovely class where several minutes are spent in a series of deep relaxation postures using bolsters, blankets & pillows. The class is held in flickering candlelight with soft music & helps melt away your stress. You will leave feeling restored & relaxed. This class alternates with our Monday night Stretch Intense and Restore classes. (alternate Mondays at 7:30 PM plus select Tuesdays at 730 PM). MEDITATION: See our Stress-Buster Series above for offerings on Tuesday evenings at 7:30 PM. Also try our Thursday night class at 4:45 PM: “Stretch and Meditate 101” class with Lynn Carapella. Starting November, 2018, try also the seated “Chair Yoga Stretch and Meditation” class on Wednesdays at 6 PM. BEGINNER STRETCH (B) (Rose for April; Rosanne for May and June) : This class is great for those who are new to yoga, as well as for experienced students who would like to focus on their practice at a slower pace. You will gently stretch & move through fundamental yoga postures combining breath with movement. The class encompasses standing postures, floor stretches on the mat & poses to help improve balance. Props are used to help support you. You will become more flexible & gain strength! (Mon., 6 PM). BEGINNER YOGA (B) (Nancy): Beginner yoga is great for those who are new to yoga or like a more basic practice. After a gentle warm up, you learn flowing postures combining breath & movement, and fundamental beginner poses to build strength, flexibility & balance. All classes end with a relaxation pose. (Sat. at 8:30 AM, Sunday at 945 AM). 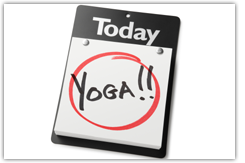 NOTE: There are many beginner-level yoga classes available on the Moonflower Yoga schedule! To see the full list of beginner-level yoga classes (not just this class), click on the FAQ tab above, and you will see a complete list of appropriate beginner-level yoga classes that you can explore. Come discover the relaxing energies of Reiki and why major medical institutions, including cancer hospitals, are now offering Reiki as an alternative therapy! Reiki is a wonderful, ancient technique that promotes stress reduction and relaxation. It is administered by a gentle “laying on hands” and is based on the concept that life force energy flows through us. If this energy is low, then we are more likely to feel ill and have higher stress levels. Reiki works toward balancing energy to promote relaxation and reduce stress. In this fabulous 4 1/2-hour training session, you will learn the basics of Reiki and receive a Level One certification. The ability to perform Reiki is passed on during an “attunement” done by a Reiki master, and allows the student to tap into life force energy to help you feel more relaxed. In this Reiki One training, you will receive 4 Reiki attunements done by Nancy Weshkoff, Reiki Master Teacher. At the end of this training, you will be able to do basic Reiki on yourself and others. There will be an opportunity to practice doing a Reiki session with a partner from the training, and you will also receive a Reiki session. You will be given a very informative, illustrated Reiki training manual which is a great tool to which you can refer after the training session. This training session will be taught by Nancy Weshkoff, Reiki Master Teacher and owner of Moonflower Yoga. The training sessions are kept to a very small group so that you receive lots of personal attention and to be sure you are comfortable with the training. Because of this, the class size is very small and it sells out quickly – book early! There will be a food break around midway through the training with delicious homemade vegan snacks, which are included in the price. Special Introductory Price: $150 per person. Book now!! Seating is limited!! You can reserve your spot by selecting this activity from the Schedule tab above and following the simple registration/payment instructions. Waiting list: A waiting list is available for any sold-out class, workshop, or training session. Just send an email to moonfloweryoga@optimum.net with your contact information, including your cell phone number, and we will get in touch with you should an opening arise. The Moonflower Yoga Book Club!! Come join us for the next meeting of our fun Moonflower Yoga Book Club! We meet every 4-6 weeks to discuss the book selection from the previous meeting & select the next book to read. It is a great way to meet interesting people, form new friendships & have lively conversations. Delicious homemade goodies are served. All are welcome to read our current book selection & join us! Picture this: a dinner party at their perfect home, the conversation and wine flowing. They appear to be in their element while entertaining. And Grace’s friends are eager to reciprocate with lunch the following week. Grace wants to go but knows she never will. Her friends call—so why doesn’t Grace ever answer the phone? And how can she cook such elaborate meals but remain so slim? And why are there bars on one of the bedroom windows? The perfect marriage? Or the perfect lie? BOOK NOW! Please register at the Moonflower Yoga studio or by selecting this event from the Schedule tab above & following the simple registration and payment steps. Friday, May 3rd, 6:30 PM – 8 PM – almost sold out – book now! – Do you struggle with finding the purpose of your life? – Do relationships and career stress you out? – Have you been looking for spiritual guidance to live your highest self? If you answered yes to any of the above questions, this is the workshop for you! As we go through the daily drama of life, we start to wonder if there’s any mindful purpose to this life. The daily drama can exhaust our creativity and make us bitter toward life. The key to happiness is in knowing that we are our biggest obstacle and we are our biggest solution. Makes sense? In this heartwarming workshop, Chandresh will share the powerful insights about how to invoke our highest potential and simply blossom in life. 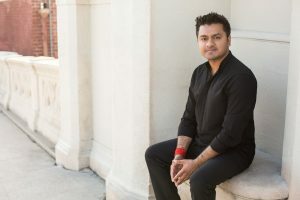 Through his stories, wisdom nuggets, and guided meditation, Chandresh will set just the perfect foundation for your spiritual growth and eternal bliss. If you feel that your life needs to bloom and be in its highest expression, show up for this gathering to dive deeper and unfold your truth. Chandresh Bhardwaj is a 7th generation spiritual teacher. He’s the author of the bestselling book ‘Break the Norms’ and runs a podcast by the same title. To know more about him, visit his website cbmeditates.com or instagram @cbmeditates. Copies of Chandresh’s book, “Break the Norms”, are available for purchase from Chandresh after the event, who can autograph your copy. Registration fee: $40 per person which includes delicious homemade dessert and beverages. BOOK NOW! Chandresh’s previous workshops at Moonflower Yoga sold out. You can register for this workshop by double clicking on this workshop from the Schedule tab above and following the simple registration and payment steps. Make a Beautiful Mother’s Day Gemstone Necklace! Saturday, May 4th, 1:30 PM – 3:30 PM- filling up quickly; book now; Carol’s previous workshops sold out. Do these traits remind you of a special woman in your life? A mother figure, a sister, an aunt, a wife, or a close friend who you admire? Honor that special woman by making a gemstone necklace to give her for Mother’s Day. Join Carol Procopio at Moonflower Yoga in learning to string a necklace from gemstones, including meditative blue apatite and prosperity fostering citrine with a blue patina brass focal piece depicting an elegant Great Heron, a symbol of peacefulness, self-awareness, and confidence. About Carol: Carol Procopio is a Reiki Master Teacher. She has been taking yoga classes for many years, finding the practice essential to emotional and physical health. She also finds joy in sharing her love of yoga with her husband Craig. Trained as an artist, Carol strives to use her creativity to promote healing. Price: $75 per person which includes all materials to create your beautiful Mother’s Day necklace, as well as delicious homemade snacks. BOOK NOW – space is limited! You can register for this activity by selecting this workshop from the Schedule tab listed above. Double click on the date and then follow the simple payment and registration steps. Moonflower Yoga Mah Jongg Club! Come join us for our fun Moonflower Yoga Mah Jongg Club! 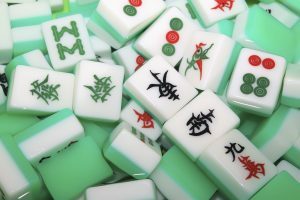 We are looking for experienced Mah Jongg players who are willing to teach newcomers, as well as new players who would like to learn how to play. 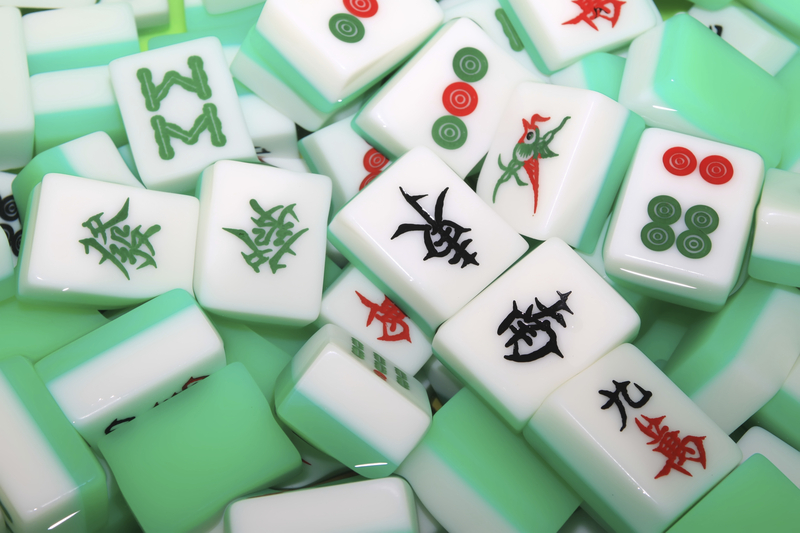 Please bring your own 2019 National Mah Jongg card available online or at specialty stores. This is a great way to have fun, learn something different, and meet new people! Yummy homemade dessert is served. Date: Friday, May 10th, 6:30 PM – 8:15 PM – book early – this sells out quickly! Reiki is a wonderful system to promote relaxation and has been used for many years. With Reiki, you are working with universal life force healing energy. It is now being offered as an alternative therapy in leading medical institutions. Reiki is done by gently hovering your hands on the person receiving the treatment. For those who are Reiki trained, you will use your Reiki knowledge to provide a treatment to the person in the center of the healing circle. For those who are not Reiki trained, you are welcome to come, and we will show you the simple steps you can do. Each person will have an opportunity to receive a Reiki treatment while comfortably reclining. When not receiving a treatment, you will help send energy to the person in the circle receiving the Reiki treatment. It is a great way to discover Reiki, or to enhance your Reiki training, and you will feel relaxed and de-stressed. NO prior Reiki experience is needed, and all are welcome. Come explore the relaxing & de-stressing qualities of Reiki and why leading medical institutions are offering Reiki as an alternative therapy! Saturday, June 29th, 1:15 PM – 5:45 PM – only one spot open – book now! Further explore Reiki in this wonderful Reiki Two training available to anyone who has successfully completed Reiki Level One training! In this special 4 1/2-hour Level Two training session, you will delve deeper into the principles of Reiki and receive a Level Two certification. You will receive 2 additional attunements to increase your spiritual vibration. Discover the first 3 symbols of Reiki and learn how to incorporate these into your Reiki practice. Use of the Reiki symbols also increases your Reiki energy. One of the symbols you will learn is the distance symbol which allows you to send Reiki energy to people who are at a distance and not in the same room as you. You will have an opportunity to practice using the symbols during a Reiki session with another person from the training, and you will also receive a Reiki treatment. A very informative, 40-page, illustrated handbook will be provided to you to take home as a great reference tool so you can continue to practice and learn the information from this Reiki Two training session after you leave. There will be a break with delicious homemade snacks. This Reiki Level Two training session will be taught by Nancy Weshkoff, Owner of Moonflower Yoga and Reiki Master Teacher. Price: $175 per person. Please note this training session size is kept very small so that you receive the maximum personal attention to help you with your training. Please book early as it sells out quickly due to the small-class size. Wait list available: There is a wait list available for any sold-out workshop, event, or class. Send an email to moonfloweryoga@optimum.net with your contact info, including your cell phone number, and we will get in touch with you should an opening occur. Thank you. New meeting date TBA soon – stay tuned! Come join us for the next meeting of our fun Moonflower Yoga Needle Arts Group! The group consists of experienced members who will share their knowledge to teach newcomers. Each person brings their own materials, and you will work on your individual piece (crocheting, knitting, quilting, embroidery, etc). It is an opportunity to learn something new, get great ideas, share your handiwork, and make new friends. Plus working with your hands in a different way than computer work is relaxing and meditative as you make your own unique creation. Yummy, homemade goodies will be served as we enjoy each other’s company. You’ll have a blast! Fee to cover costs: $10 per person, per meeting date, which includes delicious homemade food. Saturday, June 22nd, 1:15 PM – 5:45 PM – book early as this sells out quickly and space is limited. This training is available to those students who successfully completed Reiki Level One and Reiki Level two training. Become a Reiki Master! In Reiki 3, you will further enhance your Reiki experience and upon completion reach the level of Reiki Master/Practitioner. You will learn the final 3 symbols of Reiki. You will receive 4 more attunements, which further enhances your energy fields. Learn a new Reiki breathing technique which is used in the attunement process, as well as a deeper understanding of Reiki’s connection to other healing modalities, and a new blessing technique to enhance your Reiki treatments. To help you with your practice after this training session, an extensive 30-40 page, illustrated training manual is supplied which is a great reference tool after the training session. We will have some brief breaks with delicious vegan food from Bob on hand. Price: $195 per person. Please note this training session size is kept very small so that you receive the maximum personal attention to help you with your training. Please book early as it sells out quickly due to the small-class size. Register now for this fabulous training session – space is limited! You can reserve your spot at the Moonflower Yoga studio or by selecting this training session from the Schedule tab above and following the simple registration and payment steps to reserve your spot. Moonflower Yoga is pleased to announce an intriguing new series to our line-up: Women’s Gathering! 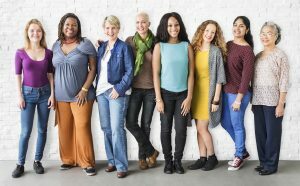 This fabulous series focuses on a variety of different topics that are of interest to women. They provide an opportunity to learn something new, have fun & find support for some challenging topics. Topics so far have covered a poetry reading of “BENDING TO BEAUTY” with author Dian Zirilli-Mares discussing a woman’s journey, an informative lecture on “Understanding Medicaid” with a health care professional, and an open conversation on “Coping with Menopause”. Please stay tuned for our next topic which will be added soon to the workshop and event line-up! Our class sizes are small to provide individual attention, and we recommend that you reserve your class in advance. Most classes have a maximum booking of 6-8 students per class. If a class is listed in solid red font on the calendar tab, the class is fully booked for the day. If the class or workshop you wish to attend is sold out, please contact us and ask to be added to the waiting list. Cancellations do occur, and if a spot opens up, we will reach out to you. Please send an email to moonfloweryoga@optimum.net with your name, phone number, and email address, and we will get in touch with you if an opening occurs to the waiting list for the class or workshop you are seeking. Thank you! Private one-on-one sessions are available at the Moonflower Yoga studio. We will design a private yoga class just for you tailored to your individual needs! Please call us at (516) 557-2206 for more information. We are available for corporate yoga or group yoga classes! A Moonflower instructor can come to your nearby place of business to teach a group yoga class. Corporate yoga in the workplace is a great way to reduce stress, relieve muscle tension from the day, and promote teamwork among the staff. Please contact us at (516) 557-2206 and let us know how we can help you. You can also click on our “Corporate Yoga” tab above for additional info.